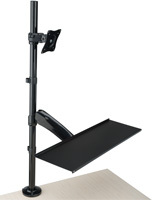 These Multiple Monitor Mounts Are Affordably Priced! Thousands of In Stock TV Stands and Mobile Carts Can Be Found In This Website! Order Multiple Monitor Mounts Today For Immediate Delivery! Innovative stand provides accommodation for (6) 23" TVs, (3) on each arm! 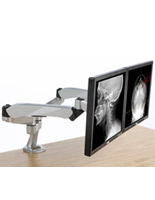 Height adjustable brackets enable users to situate panel screens in vertical or horizontal orientation! Detachable grommet transforms into desk clamp for permanent fixture placement! Space-saving design minimizes clutter on desk top! 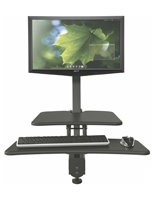 Multiple monitor mounts, like these LCD desk stands, are ideal for any profession that uses various screens daily to accomplish essential tasks! 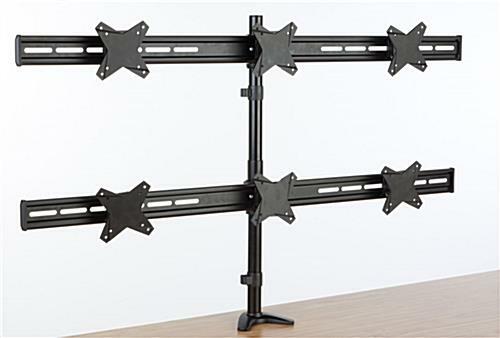 Each arm has three brackets all of which have swiveling capabilities, a hassle free, valuable attribute to users that change the direction of an LCD television often! 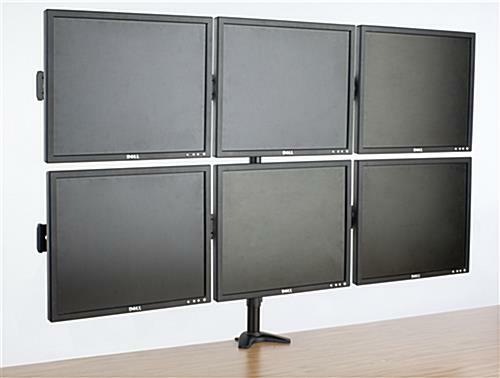 These desk display holders, multiple monitor mounts that can display (6) horizontal screens only measures 48" wide and stacks double rows of screens without trouble. In retrospect, six 23" LCD televisions would absorb a great deal of space on a table and when scattered and positioned individually, viewing materials is challenging and can be extremely frustrating! 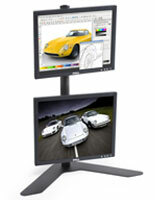 When all screens can be situated on a stand as one, not only do multiple monitor mounts save space, but the cords and cables that power each flat panel unit can be neatly kept together with all others along the backside of the post. This unique feature prevents accidents, can help to conceal messy wires and with any expectancy, these stands can help promote a clean, tidy workspace! 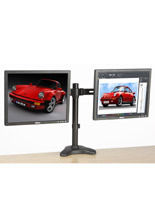 These dual arm racks, multiple monitor mounts that include a clamp and grommet mounting system can be used for temporary or permanent placement. Changing between options is easy and can be completed in a matter of seconds! The clamping device allows for quick, impermanent placement while the grommet is designed for permanent fixtures! 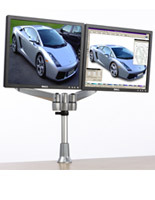 These LCD desk top stands, multiple monitor mounts that can hold flat panel screens up to 24" are used by many types of industry professionals, including surveillance companies, multimedia designers, editors, information technology personnel, medical physicians and investors to carry out necessary duties in an efficient manner! Customers who have purchased these holders agree that productivity has increased and jobs are completed faster! 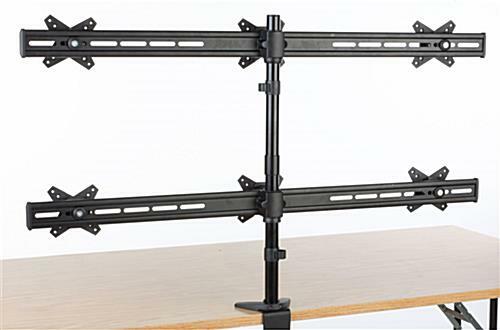 Although multiple monitor mounts consolidate room on a desk, the affordable dual arm racks shown on this page provide beneficial, distinct features to all users that most other models simply cannot offer! 48.0" x 29.8" x 4.8"